[ARCHIVED THREAD] - Dry coat powder coating methods. 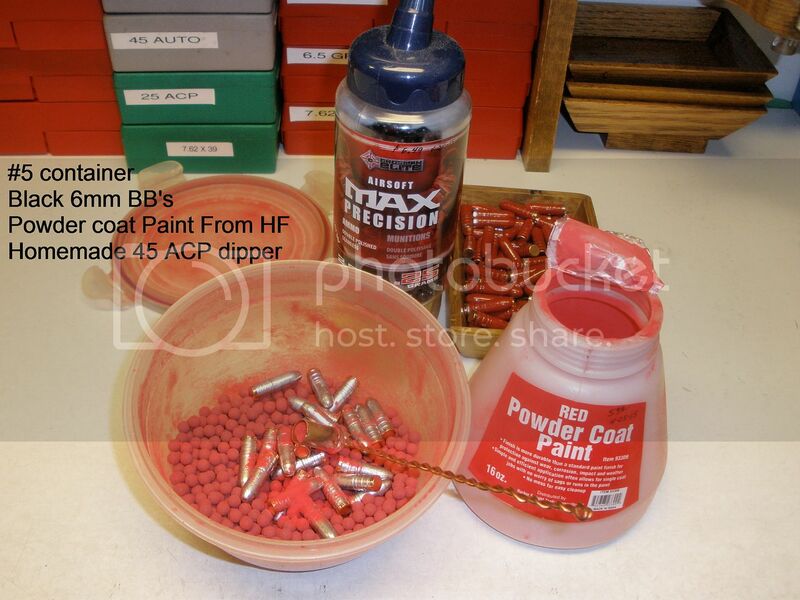 Several of you have asked over the last few months how I have been applying powder coat to my cast pistol bullets. It took me a few tries to get the balance right between the number of black air soft BBs, vs the number of bullets, vs the amount of powder in the plastic container correct. The biggest hurdle I had to over come with this project was actually getting the powder to stick to the bullets. I tried the circular hand motion, I tried tumbling by hand, I tried circular motion on the carpet all with poor results. After watching a few YouTube videos I found guys that were dedicating a vibratory tumbler to the task. I really didn't want to dedicate a whole tumbler to messy powder coating. So I came up with this alternate method. I literally just piggy back my plasticware containers on to the top of my Dillon tumbler for 20 minutes simply using a strip of packing tape. Can you say multi tasking? This methods works so well that you can easily coat in one coat and often have to knock off a lot of powder before placing the bullets onto the parchment paper. You say you don't want to do it, so fair enough, but I just throw a boatload of airsoft bbs in a harbor freight tumbler with a few hundred bullets and run it for about 30 seconds. Bam, perfect coating. The five pound tumbler is what, $50? I think the biggest thing I don't like about a dedicated tumbler is just any further making of messes just getting the bullets back out of the tumbler. With the plastic wear I just pop the lid off and pluck them out with some large tweezers until empty. Reload with bullets and repeat. No messes, no clean up, no powder spilled anywhere. To be fair, running it to 20 minutes may be excessive but I run it for that long just because that's how long the toaster oven is on for. I've had great luck with #5 container and hand shaking to about 30 seconds. Lots of powder, 3 layers of black BB's, about 50 bullets. Thanks dry. I don't know if it's a humidity level or atmospheric thing but I had no luck by hand in a #5 container. Maybe if I wanted to do 2 or 3 coats. I prefer one coat, otherwise it's just not worth the time and headache. To be fair, I never actually tried just doing it for 30 seconds. Maybe I was over doing it somehow by trying to go a couple minutes to 10 minutes by hand? Use nitrile gloves instead of tweezers also if you want to save some time. You can get a big pack of them cheap at the grocery store. 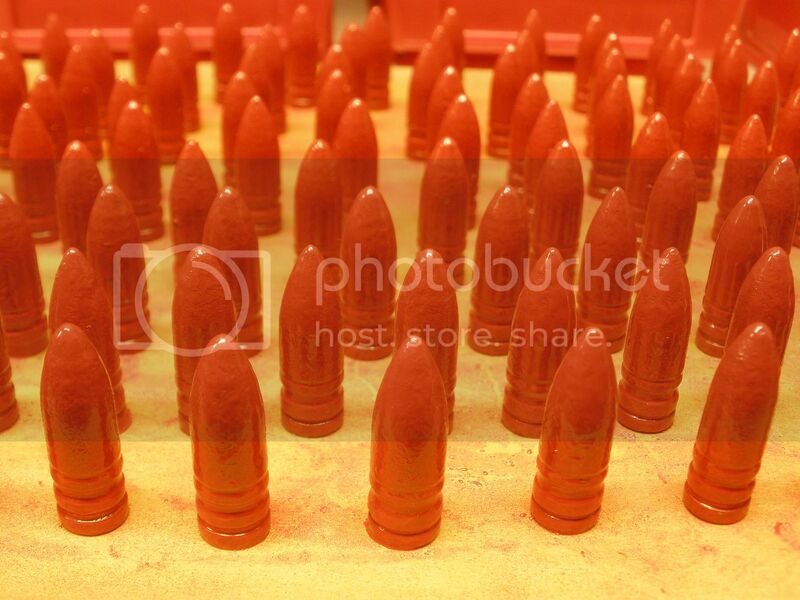 "Dust" them with some coating by running them through your tub of bbs and you can handle your bullets safely and quickly without compromising the coating. That will save you tons of time over handling each of them with tweezers. You might have some of those gloves sitting around right now. Awesome idea and yes I have both latex and nitrile gloves on hand. I will give that a try. Learning as I go. Love this board. I only do 1 coat and I'm on the wet side of the state. Maybe not enough powder or BB's? Too many bullets? eta, the reason I don't use gloves is I pick up bullets with needle nose pliers and tap off excessive powder on the side of the bowl. You get an even coat that way. I have no idea if latex work as well or if at all (they probably do). I just tried it with nitrile, they worked, so I never attempted it with latex. You can get shake the bullets while handling them with the gloves to knock off excess. Of late I just throw them all in a oven pan on parchment paper and just roll them around a bit. I'm going to give this a try. Grabbing the bullets with needle nose pliers is the most frustrating part of the process. Damn, I thought for sure we talked about this once before and I thought you said you were on the dry side. I do about 3 layers of BBs deep. Between one and two tablespooons of powder. and I've settled on between 50 and 60 bullets in the tub at a time. I'm very happy with the results but if I can learn ways to do it better and more efficient then by all means hell yeah! I don't think I could do it with needle nose. The dexterity would be off for me. I am using some harbor freight tweezers that are about 7 inches long and open naturally to about 3/4s inch. 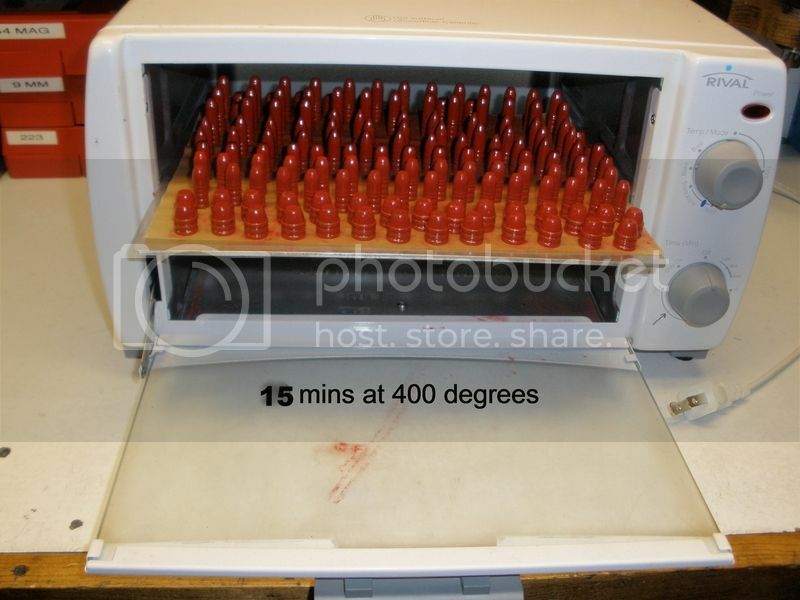 I can lay out a hundred bullets in less than 5 minutes and not make a mess of the coating. Still will give the Nitrile gloves a dry for grins. Got to remember to put some powder on the glove fingers as well. That does make sense. I may have to give this a swing again sometime. I have PC a shot once or twice with an electrostatic gun and the whole operation was just a giant hassle. Got me mixed up with someone else, I'm defiantly on the wet side. Well it would definitely be a pleasure to meet you someday if we ever happen to cross paths dryflash! I'm going to be at the funshow at opening time this Saturday. If that works, switch to IM's. Brilliant idea you have there piggybacking the containers on top of the tumbler-less mess less fuss. Don't mean to hijack this thread, I want to eventually start doing this, but I have some questions. What are the benefits to doing this? Cleaner barrel? less smoke with some powders? safer to handle? What do you use for powder coat? I saw on youtube people were just getting the powder coat from HF. Is there something better to use? After you do this, can you just load them up or do you have to re size them back down because the coating increases the diameter? If so, how do you do that? Sorry about all the questions, I am just getting back into the hobby after a 4 year hiatus. http://castboolits.gunloads.com/forumdisplay.php?184-Coatings-and-Alternatives Start here, read the stickies, this is how I learned. This what you need to get started. Has to be black BB, has to be a #5 container, HF red works good. the other colors HF has don't work. You also need a $20 toaster oven. Need to test thermostat with a oven thermometer to find 400 degrees. Then mark dial. Notice mark on my dial. The results. !55 gr Lee 2R mold. For 300 blk or 7.62x39, depending on how their sized. .310 or .314. Lee push through sizing die used to size. They are <$20 and screw into a press like a die. Work great. 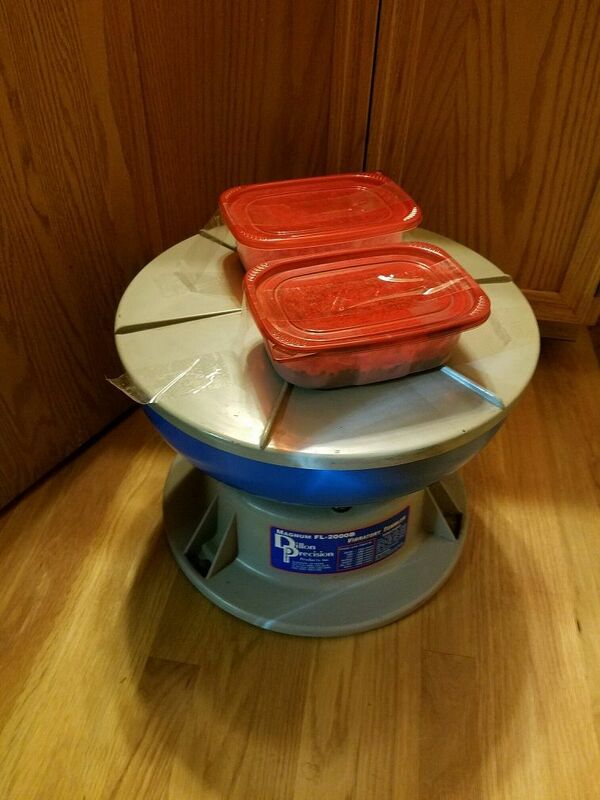 #5 container, look at the bottom of bowl. Will have a triangle with a 5 in the middle. That's the plastic that produces the static needed. Same for the color of the BB's. It makes a huge difference when you use the right stuff. Got mine at Wally world. Benefits; puts a polymer jacket on bullet. So no smoke, no leading, so lube mess on bullets, dies, gun, ammo or you. Yes use a gas check if you mold style uses one. For pistol bullets, use a mold without a gas check. I use parchment paper so bullets don't stick to oven tray. Available right with the wax paper, Alum foil in supermarket. Last weekend I shot 44 mag. Home cast 310 gr GC with a top load I worked up to, 22 grs of H-110. Stout load in Redhalk. No leading, pistol very clean, just like shooting jacketed bullets. I tried the piggy back route and it too long for me to get good results. I have noticed the powder behaves much better in the north east winter months rather the summer months. Just like DF, I use black air soft BB's and a #5 plastic container. I do 100-150 pistol bullets at a shake and bake session. 1 to 2 minutes shaking by hand gives me complete coverage. I differ when it comes time to bake. I dump the bullets out on hardware cloth, shake the hardware cloth a bit and into the oven they go. They come out 99% coated in one coat and leave some very minor marks where they rest on the hardware cloth. Just not worth it for me to use tweezers. here, I used HF red and HF white. the white mixed with the red so they really came out pinkish. this happened to me and now I use the non stick foil, I just dump them into the rack like you have give them a shake and bake them. they have good coverage and no bare marks where they hit the basket. bullets look really nice. where did you get the purple? When saying lots of powder how much would that be? Like say in the containers in my first picture with three layers of BBs? Big difference between 2 tablespoons and 6 tablespoons. I'm only starting with about 2 table spoons and it's seems there is a good bit of powder laying in the bottom of the tub below the BBs. Maybe I need to add a few more tablespoons? At what point is there too much powder in there? I really have not experienced too much powder. I probably have a little over 1/8 inch in the bottom of my bowl after the bullets have been picked out. When I need powder I no longer measure, I just dump some in from the powder container. Having enough BB's are also important. Just doesn't cover right with too few BB's. Ok, that sounds good. Sounds like I may need to try more powder and more BBs in the same container with the same amount of bullets I've been running. Just tried hand shaking some 40 S&Ws boolits for 30 seconds to a minute with my old ratios and was still getting lots of bare spots. Will adjust on the next batch and see what happens. How many bullets in that last bowl? I do around 50 at a time depending on the size. Try swirling the container around for about 30 seconds, then shake it up and down for same time. The up and down motion is supposed to really help with the powder coverage. This. The technique really made a difference for me. As did getting quality powder. I never could make HF red work, but I got some from Smoke4320 over at Castboolits and I have no trouble doing this in a wooden shed during the rain. Swirl for 20-30 seconds and then up and down vigorously for 5 to 10. He gets rave reviews on his powder. This is pretty much what I do except I use a metal vegetable strainer to catch the unemployment used powder. After that I put it on in the oven. This was the missing trick for me boys! Thanks a ton for the pro tip! Sometimes its the simplest things. Glad you are getting good results now. Yeah, I found the same thing. Just swirling around in the container doesn't give good coverage. I actually turn it upside down and swirl for about 15 seconds to let the powder on the bottom of the container work its way to the top and coat all the bullets. Works fine for me. So I've got the oven fired up out in the garage for another try at powdercoating. This time with dry tumbling instead of the electrostatic harbor freight system which is messy and a lot more slow going (but cove/img]rage is superb). Built up 2 racks out of 1/4" galvanized steel mesh from HomeD. They're undersized by 1" on all sides which makes them easy to get in and out of the oven and I can get about 50-70 per shot. I'm standing them up on it, using my gloved hands to fish them out of the container. Using a 0.75l #5 (that's the number inside the recycling triangle) square'ish container and some Harbor Freight RED. Red is much easier to get decent coating on the first go than the matte black which was requiring 2 goes (it may be that i opened that can of black 2 years ago). I find I can cut it 2 parts red and one part black and still get good results (pretty BADASS that is). I'm not going to obsess about 100% coverage. I'm doing 2 handfulls of bullets for one flat tsp of powder, and they're coming out pretty good and the whole operation moves along pretty neatly. 10-15min in the convection oven (must be convection, trust me) at 400F. BTW, the BB's I'm using are Crossman Elite 6mm 0.12grams and clear red.